Size of this preview: 617 × 600 pixels. Other resolutions: 247 × 240 pixels | 1,200 × 1,166 pixels. Description: Grasshoppers (Melanoplus sp.) 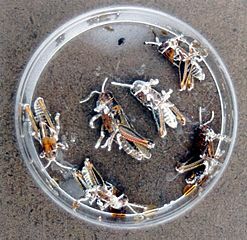 killed by the fungus Beauveria bassiana. Permission: This image is in the public domain because it contains materials that originally came from the Agricultural Research Service, the research agency of the United States Department of Agriculture. English | español | فارسی | italiano | македонски | മലയാളം | Türkçe | 中文（简体）‎ | +/− This file was reviewed on 26 July 2009 by the administrator or trusted user NuclearWarfare (talk), who confirmed the Public Domain status on that date.